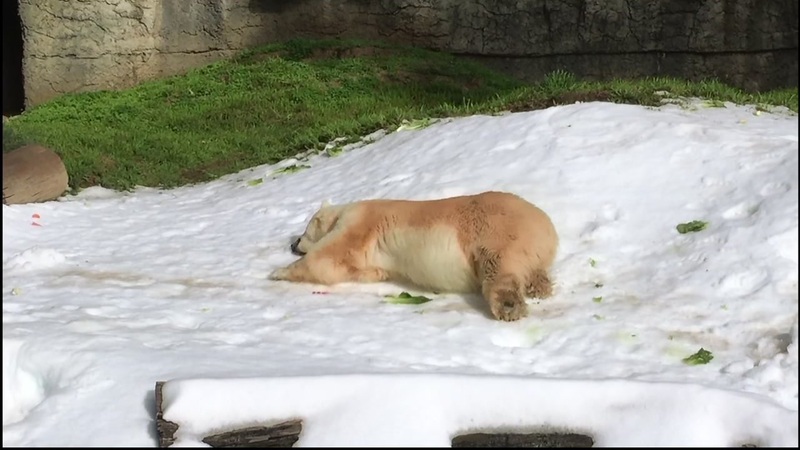 SAN FRANCISCO -- Winter arrived early for the San Francisco Zoo's resident polar bear this morning when 10 tons of snow was delivered to her habitat, zoo officials announced. The delivery was a special treat for the 35-year-old Arctic native named Uulu, who is also the oldest polar bear in North America, according to zoo officials. Uulu has lived at the zoo since 1985. She was given a permanent home there after she was found foraging in a dump and trying to sneak into homes in Churchill, Canada, zoo officials said. "Our expert animal, medical and wellness teams have spent a lot of time collaborating to keep Uulu in the best health possible for her advanced age," the zoo's Vice President of Marketing and Strategic Growth Steven Haines said in a statement. "This event is a great way to connect with Uulu and learn more about the animals the zoo has rescued over the years. Aside from Uulu, many other animals have been rescued from poor conditions, such as sea lions, grizzly bears, hippo and bald eagles, according to zoo officials. The special delivery was provided by ABODA, a global housing solutions company, which recently opened a regional office serving the greater Bay Area, zoo officials said. "Delivering a snow day to Uulu is our way of extending the early comforts of winter to her as well as doing a great thing for our local community in the Bay Area," ABODA's President Lee Curtis said in a statement. Earlier this year, on International Polar Bear Day, Feb. 7, Uulu also received snow, which stuck around for three days.